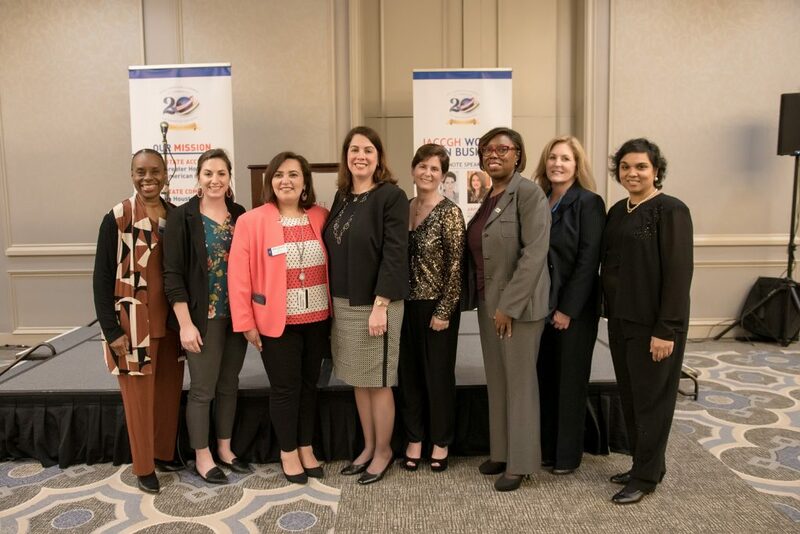 The Indo American Chamber of Commerce of Greater Houston held its inaugural Women Mean Business Series event of 2019 featuring Keynote Speakers Gabriella Rowe & Arpita Bhandari on February 27th. Executive Director Jagdip Ahluwalia, thanked sponsors SHELL, for their generous support to both the Women Mean Business and the Distinguished Lecture Series. He highlighted the growth of the chamber, stating that the chamber’s diverse inclusivity is due to a good mix of business leaders and members from the local community. Arpita Bhandari, the co-founder of the BioUrja Group, spoke about leadership and how she strived to realize her personal potential. A successful businesswoman, who initially immigrated to Louisiana in early 1990’s, in teenage years performed odd jobs to make ends meet, to starting day-care centers and owning convenience stores, She relayed a fascinating journey that saw the struggles of a young, ambitious but determined couple starting their lives out together to finally launching an energy commodity trading company with her husband, which now is among the largest privately held groups in the Houston area. Arpita stressed the importance of balance between work and home and staying focused on goals, approaching success one step at a time Mrs. Bhandari is also extremely active in supporting various philanthropic causes. Gabriella Rowe, CEO of Station Houston, the city’s largest hub for startup technology, spoke about the Journey she went through in her professional career. “To foster creativity and innovation using technology” is how she rose to become one of the few Women CEO’s of a large Tech Acceleration company in Houston. She spoke about her challenging journey growing up and how those challenges helped share her. Prior to Station Houston, Gaby was an education executive, investment banker and management consultant in New York for more than 25 years. Her deep love for Houston is one of her motivators to excel in her work, focusing “on the future of work”. Gaby also motivated the women in the audience to rely on the multi-faceted strengths within them to excel and succeed. The event concluded with an engaging Q& A session followed by Shell Representative Ana Kopf delivering the Thank you note and giving a token on appreciation to the speakers.